Why not use your existing over sized grids or buy some used grids for your Speed lights. 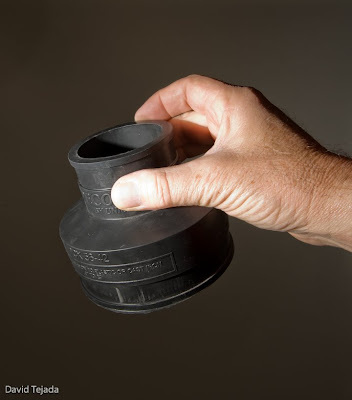 I went to Ace Hardware Store and bought a rubber "Reducing Coupling" which fits perfectly over my Nikon SB-800's. 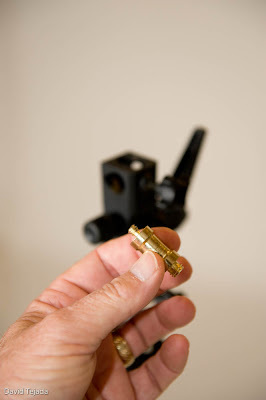 This Reducing Coupling is a 4" to 2" in size, the small end of the coupling fits snugly over the head of my SB-800 Strobe. 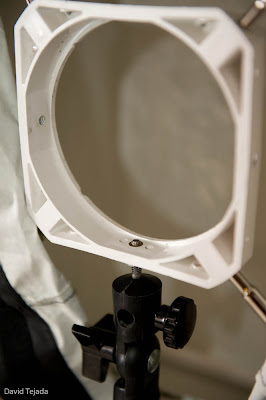 With the use of a small bungie cord you can easily hold your grid in place. The length of the Reducing Coupling places the grid at such a distance that the projected light has a wonderful quality to it. Better than if you where to just place the grid on the face of the strobe. You can pick up new grids for around $25 each however most grids are sold in sets of 4. Looking on ebay just now show several sets for sale, my guess is that you could pick up a set for between $50 and $75 bucks. 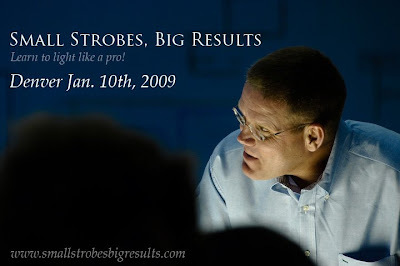 I am looking for your input regarding my Small Strobes, Big Results Workshops. You will notice that I have up a Poll or Survey on the right hand banner of my blog. 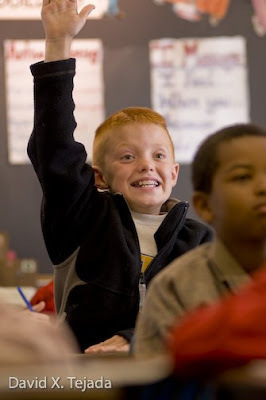 I would like to know what days of the week would work best for you if you were to attend one of my workshops. The majority of my workshops have been held on Saturdays. If you're a wedding shooter this could be problematic. There have been several individuals asking about my availability for private mentoring. For those that prefer private one on one instruction rather than a workshop setting, I am available do just that. Over the Thanksgiving holiday, I did just that with Mike Lavoie of Indiana. Mike was interested in attending the Indianapolis Small Strobes, Big Results workshop held several weeks ago. The workshop had sold out before Mike could secure a spot for himself. 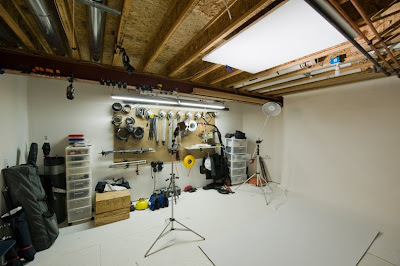 Mike was very interested in jump starting his lighting education and decided to arrange private instruction while visiting family in Colorado Springs during Thanksgiving. He had a wonderful time and I thought I'd share his comments with you here. "I had viewed Davids work on line for several months. I was intrigued by the masterful speedlight techniques, blended with ambient light apparent in all his photos. The corporate work he was doing especially caught my eye. 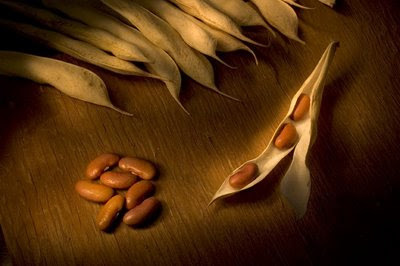 With the use of several speedlights, slaves and natural light, David is able to paint images with light in much the same way that the old masters painted on canvas. I quickly realized that he was light years ahead of me and if I didn't have the intelligence to outright steal his secrets from his photos then I would have to ante up and pay for them. I contacted David and was told that he was holding one of his workshops in Indianapolis but that it was sold out. It worked out that I was spending my Thanksgiving holiday with family in Colorado and it was quickly agreed that I would meet David at his home near Denver for a "one on one" session. His passion for the project was obvious the moment I arrived and the chemistry between us was immediate and comfortable. It started with the excellent coffee and jetted into high gear in a no non-sense, structured hands on course that has elevated my photographic thinking to the next level. 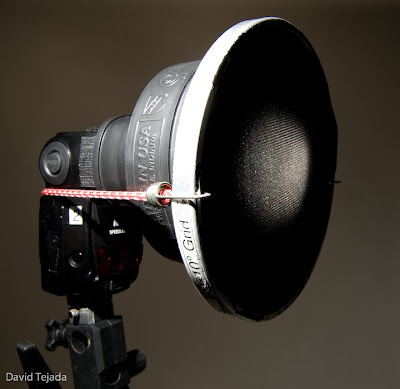 I was able to use all the resources of Davids' studio, both software and hardware equipment. I was taken through several different lighting setups. This was not with the intention of my parroting his setups but rather to open the doors of my own creative vision. I cannot recommend a private session with David highly enough. It is money well spend, an investment in my business that will be returned many times over. Thank you, David!!!" Just a quick note: I was recently interview by Lawrence Atienza, his the brains behind the blog "Memoirs of a Weekend Photographer". My interview will be available just after the New Year on January the 11th. Toronto Small Strobes, Big Results Workshop? 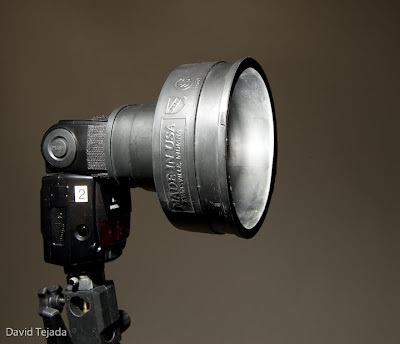 Let me throw this out there, I've had a few emails asking for a Small Strobes, Big Results workshop in Toronto, Canada. I'm just thinking out loud right now, I'll be speaking at the 48th annual UPAA symposium in Jamestown, NY. in June of 2009. This put me pretty close to the Toronto area, and a workshop could be arranged if the interest is there? If you live in the area of Toronto and interested in attending a Small Strobes, Big Results workshop, I'd love to hear from you. Just thinking out loud. I've never been to Toronto! 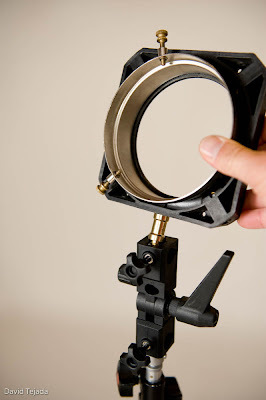 I've had several emails asking me about how I set up my strobe and speed ring combo. I have several speed rings in my arsenal, you don't need an expensive one to do this. This photos show a very inexpensive speed ring from... hell can't remember who's this is, it very cheap, but works. 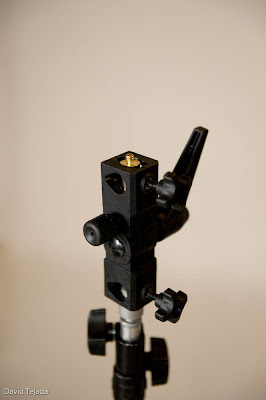 I use a standard umbrella adapter with a 1/4 20 male post on it. The speed ring has 1/4-20 threads on one of the sides, all of my speed ring have it so I assume that they all do. I just screw the umbrella adapter into the speed ring. Here's another look at, just a bit closer. 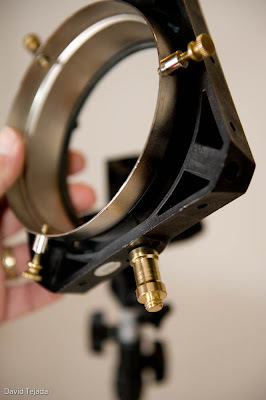 When it comes to attaching my strobes to the speed ring, I simply use a "Justin Clamp" clamped to the ring. 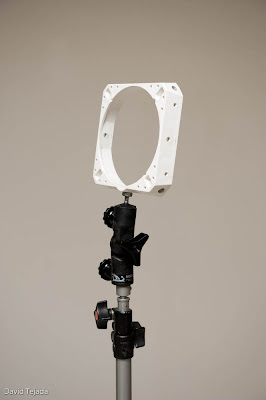 I use this method on all of my Octa's as well. I work primarily as a "location" shooter for corporate and industrial clients with business all over the world. This work requires me to travel quite a bit and therefore, my need for studio space to shoot in is seldom. Like so many other photographers, I work out of my home. 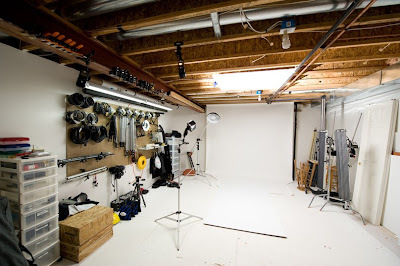 I once had a studio earlier in my career for about 6 years in cool area of Denver. Over the 6 years I occupied that space, I shot perhaps 15 or 20 times. Do to the nature of my business it just didn't make sense having a studio. My studio is located in my basement, Debbie calls it the black hole. I occupy the entire basement, office and shooting space. The shooting space small, for sure, when I need a larger space to shoot in, I rent a studio in town. 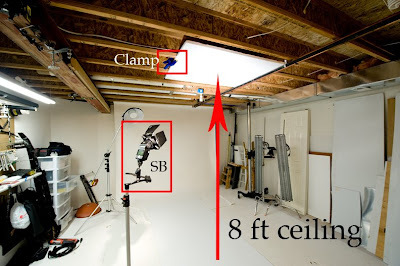 The ceiling height in my shooting space is 8 feet, I sure wish it where higher! There are times when I need overhead lighting for a shot and there isn't enough space above to put a softbox or some other modifier. My solution for the low ceiling is to simply bounce a strobe into a white board which becomes my light source. From the photo above you can see the the size of my shooting space. I have a piece of styrofoam clamped to the floor joists overhead. 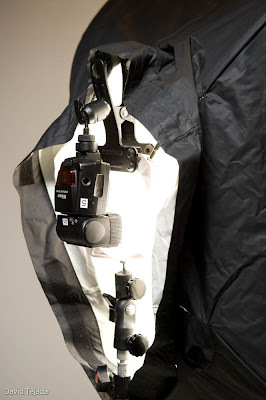 I simply bounce a strobe into it in order to produce soft overhead lighting. 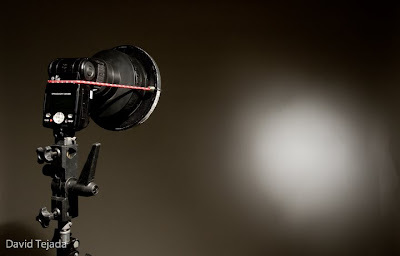 I'm using a set of "Barn Doors" or some other type of gobo on the strobe in order to contain the light and preventing any unwanted spill or flare. Here are a few more view of the crib, my wife calls it the black hole. When I go downstairs to work, I'm there for the day. Working all the time, even harder than ever with today E.
My assistant Erik Lawrence has posted a short video at YouTube at his blog showing how he created this photo using just a mag-lite. Light painting is a lot of fun and with digital now a days, you know what you have as soon as you shot it. You can read and see his video HERE. 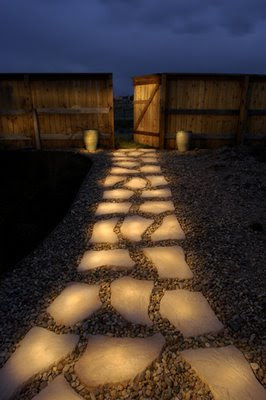 Back in Sept. of 2007 I posted an article on this blog showing how I used a 1 million candle power flashlight to create this image of my stone path in my back yard. You can read more HERE. By now you all have heard about David Hobby's recent post "Four Reason to Consider Working for Free". What David is proposing is not new, many well know photographers grew their careers by doing free work. Many other blogger have weighed in on David post and I would recommend reading all of them. 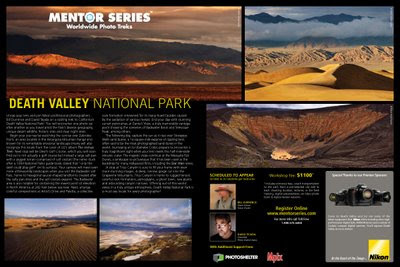 Chase Jarvis, Moose Petterson and Vincent Laforet. After reading all of these posts, I would have to say that I most closely align myself with Vincent's point of view. There is a balance that needs to be struck... Read them all for yourself. I just got off the phone with Vanessa V. who is the Special Events Coordinator for Popular Photography/America PHOTO Mentor Series. Vanessa told me that there are only a few spaces left for the Death Valley, CA trek in Feb. Bill Durrence and I will be leading this Trek and if you've been sitting on the fence thinking about going, don't wait any longer. I would hate to have you miss out on this wonderful trip! I plan on bring a few strobes! Just a quick note: I have 4 more spaces available for the Jan. 10th, 2009 Small Strobes, Big Results workshop being held in Denver. If your interested in attending, please contact me. I've been a contract shooter for Getty Corporate Images for more than 10 years. I shoot a handful of assignments a year for them and this post is about my most recent assignment for them. 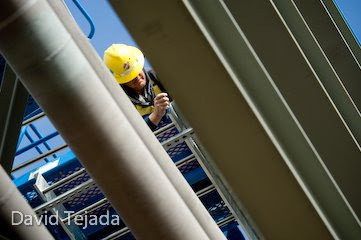 I was asked to photograph a construction project just outside of Pueblo, CO for an engineering firm. 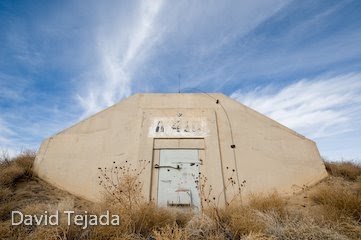 The project I was assigned to photograph is a new "chemical weapons dismantling" facility. The U.S. government has stockpiles of WWII mustard agent mortars that need to be destroyed. This project is just getting off or should I say "out of the ground", the completion date is sometime in 2013 or so. Needless to say, there wasn't much to photograph, some concrete pad work and very little iron out of the ground. Over the last 25 years I've encountered this type of situation numerous times. You have an assignment that sound terrific and interesting only to find out that there's not much to photography when you arrive on location. I know I'm not the only one that this happens to. In situations like this you really have to put on your creative thinking hat. 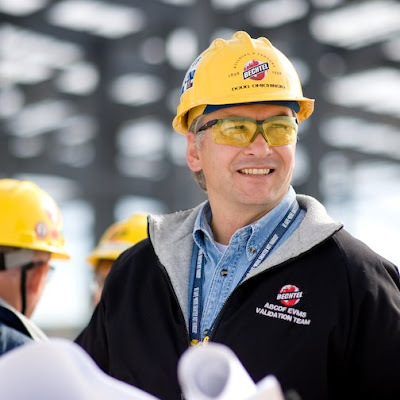 I keep mine just under my hard hat at all times! What I really needed to do was "hide" what wasn't there. At this particular location I had plenty of obstacles to deal with, the government was one of them. Not only was there little to shoot, I was restricted from pointing my camera in certain directions due to the sensitive nature of the location I was shooting at. At this location there are what seems to be, thousands of "igloos". Igloos are the storage bunkers that the military uses for the "mustard agent" munitions. I am able to show you this example of what an igloo looks like, as these do not contain any of the munitions that are stored on base. This site was a real struggle, trying to show construction progress without showing specific locations and such. I used the sky as backgrounds and shallow death of field (DOF) to hide specific details that the government wanted hidden. I was restricted from from shooting from high places as I was not "trained or certified" for lifts and harness restraints. The next time I shoot at this location or with this client, we will need to take the time for that type of certificate. The photo on the top is an excellent example of using shallow DOF to isolate the subject from the background. This photo of just reflections on a fresh concrete pour is another way of hiding objects that where in the background of the scene. Sometime we run into these type of situations that require a different way of thinking. Using the sky, reflections and shallow DOF where good solutions to the situation at hand. Here is one more shot from our location.